Situated just above Golitha Falls on the southern edge of Bodmin Moor. Extensive Breakfast Menu, local produce, and all cooked on the range. 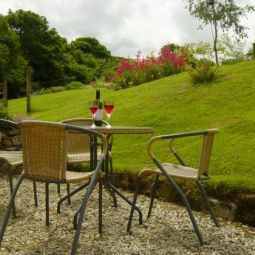 Redgate Smithy is a quality B&B perfectly situated on the edge of Bodmin Moor, just above Golitha Falls, and in the heart of SE Cornwall. Stay with us for a relaxing few days break or a longer holiday to explore the whole of Cornwall, visit friends or relatives, or to visit this lovely area on business! Golitha Falls just down the lane are a tranquil and mysterious place, peaceful, beautiful and foreboding, all at once. A King of Cornwall once died here, and Miners have toiled here. Built around 200 years ago, Redgate Smithy is now a friendly and professionally run Bed & Breakfast in Cornwall, with attractive cottage-style bedrooms, very comfortable beds, and a very extensive and tasty award winning breakfast menu. Breakfast is served in the light and airy conservatory, where you can sit and relax, and watch the birds feeding while you enjoy your own breakfast! Each bedroom has its own Freeview Digital TV, Wi-fi access, and tea & coffee making facilities. Downstairs we have a laptop set up for guests’ use, for internet access and email. We also have a lovely woodland garden for guests’ use, with a patio and other seating areas - sit back and listen to the buzzards mewing as they soar overhead! We have a large conservatory which guests are also free to use at any time. There are excellent pubs and restaurants in the local and surrounding areas that we recommend for your evening meals. We have three rooms to choose from; the Double (ensuite), the "Garden" Double (with its own private bathroom), and a Twin (ensuite). We accept Credit and Debit Cards. Our local village is St.Cleer, near Liskeard, and we are very close to Siblyback Lake and the Cornish Mining World Heritage Site at Minions. Birds and wildlife abound on and around the moor, and there are excellent walking, riding, hacking, and fishing facilities locally. We are easily accessible from both the A30 on Bodmin Moor, and the A38 from Liskeard – from the A30 at Bolventor on top of the moor, take the St.Cleer/Golitha Falls turn, and we are 7m down the Fowey valley. From the A38 at Liskeard, take the B3254, turn left up to St.Cleer; through the village half mile to the Minions road, and then turn left to Redgate. Alternatively, from the A38 in the Glynn Valley at Doublebois, take the Minions road; Redgate is 3m up by the Golitha turning. We have been awarded AA Four Stars for Guest Accommodation, and have also been awarded the AA Breakfast Award and the Secta Green Acorn Sustainable Tourism Award. From A30, take St.Cleer/Golitha Falls turn at Bolventor on Bodmin Moor, and we are 7miles down valley opposite crossroads at Redgate. From A38 at Liskeard take B3254, turn left up to St.Cleer, through village half mile to Minions/Doublebois road, turn left and Redgate is half mile down road.